Eve’s needle cactus, also called long spine cactus or cane cholla, is a tree-form cactus native to the high elevations of Ecuador and Peru (8000-12000 ft.). 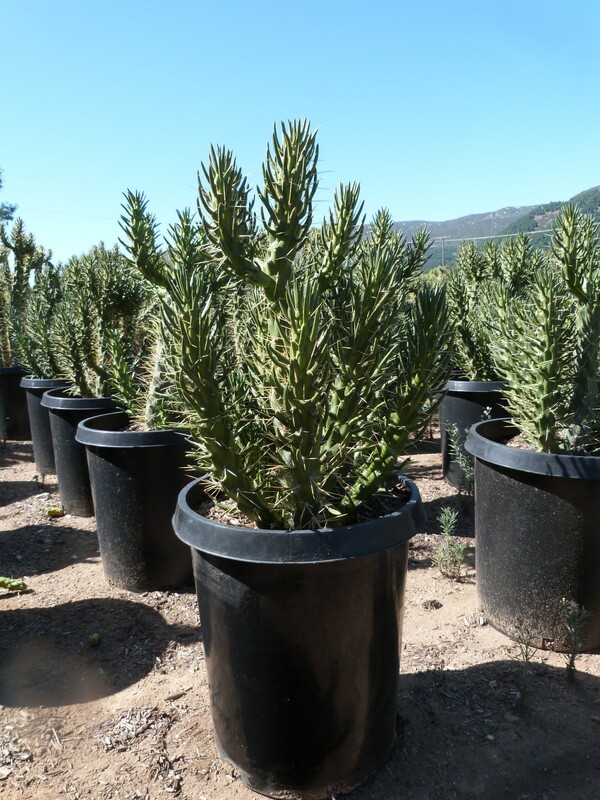 This cactus can handle low desert growing conditions and has naturalized in areas of Africa and Spain. Eve’s needle cactus looks beautiful in typical desertscape or rock gardens and can be grown indoors in large containers in a bright location. Austrocylindropuntia subulata plants can also be placed in large containers in the outdoor landscape. Its succulent branches are up to 1.5”-2.5” in width and has cylindrical leaves up to 5” in length. At each leaf or areole this cactus has 2-4 spines about 3” in length so you’ll need to take caution when handling the plant. This has beautiful opuntia-like red flowers that are 2”-4” in diameter, followed by red fruit that is about 4” in length. This cactus can tolerate alkaline soil but requires rocky well-draining soil to perform well. Due to its tropical nature be sure to protect this cactus from frost, as it can sustain severe damage or death in cold temperatures. This cactus is easy to grow and is usually pest and disease resistant.